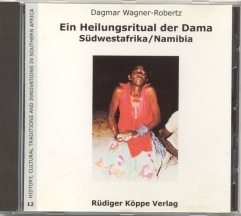 This document contains the full description of a healing ritual as performed among the Nami-Dama of Zesfontein (Northwestern Namibia) in 1975. The original text was recorded by the late Dr. Dagmar Wagner-Robertz (1944–1991) while participating in the ritual and later transcribed and translated with the assistance of local informants. The author added a comprehensive interlinear anthropological analysis of the text. The result is a book which belongs to two different genres. On the one hand it is a fine example of documentary literature of cultural history, on the other hand it constitutes an ethnographical description of a local ritual embedded in the chronology of its workings. The text is impressively complemented by nineteen colour photographs by Ruediger Wagner. This posthumous study undoubtedly represents a valuable achievement in the field of Khoisan studies, especially for the investigation of Dama culture. Because of its unique and unrepeatable character it deserves to be brought to the attention of a broader readership. Thus the editors of History, Cultural Traditions and Innovations in Southern Africa included this study into their series since it allows a glimpse of formerly practiced rituals, which today are no longer performed in the way described. The study thus provides valuable data for investigating the cultural changes that have taken place in Dama culture in Northwestern Namibia after the 1970s. This document is the first of two electronic publications using the Portable Document File (PDF)-format, now available on CD-ROM or for free download(see links below). This form of publication allowed the inclusion of the especially informative full colour photographs and enables the academic reader to perform direct computer-based analysis applying current anthropological, linguistical and philological methodology.